Yes, owning the standard for step-in bindings would be quite nice. The DC boot, which looks pretty good (we’re BOA fans), will be out for men and women in the fall of 2020. We still haven’t tried any step-in bindings since they came around the last time and we’re looking forward to trying out the Step On soon. For the official word from Burton, please follow the jump. Burlington, VT (January 30, 2019) Today, Burton officially announced that it will license its revolutionary Step On® technology to DC Shoes, which will become the first brand outside of Burton to create boots that are compatible with Step On bindings. The DC Step On boots will be available to consumers in the fall of 2020. Development plans for DC’s first Step On boots are currently underway for both men’s and women’s styles, which will be available to purchase in the fall of 2020. 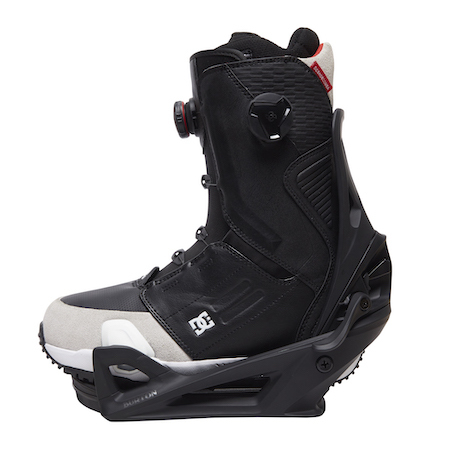 The DC Step On boots will utilize their own upper design, materials, closure and fit. In order to ensure seamless compatibility with all of Burton’s Step On binding models, DC boots will be built using Burton’s proprietary Step On boot interface. DC Step On boots will be available at the same global retailers as Burton Step On bindings so riders can easily purchase the boot and binding combination they prefer. Burton looks forward to working with additional brands down the road to ensure riders have as many boot choices as possible that are seamlessly compatible with Burton Step On bindings. By offering other brands the opportunity to access this proprietary technology that took over four years to develop, Burton’s goal is that more riders will have the chance to experience the ease and performance of Step On. For more information on Burton Step On, check out additional tech details here. In 1977, Jake Burton Carpenter founded Burton Snowboards out of his Vermont barn and has dedicated his life to snowboarding ever since. Burton has played a pivotal role in growing snowboarding from a backyard hobby to a world-class sport by creating groundbreaking products, supporting a team of top snowboarders and pushing resorts to allow snowboarding. Today, Burton designs and manufactures industry-leading products for snowboarding and the snowboard lifestyle, including snowboards, boots, bindings, outerwear and layering as well as year-round apparel, packs/bags and accessories. Privately held and owned by Jake and his wife, Burton Co-CEO Donna Carpenter, Burton’s headquarters are in Burlington, Vermont with offices in Austria, Japan, Australia, Canada and China. For more information on Burton, head to www.burton.com. This isn’t just something we do. It’s who we are. Fully committed to snowboarding and building the best gear for those who ride. DC is 20 year deep pushing product progression. Consistently raising the bar and leading the industry in the process. With a fearless approach to innovation and the world’s best riders driving development, we keep on doing what makes us who we are. Yesterday, today, and tomorrow.